Everyone needs a website at this point. If you don't have one for your business, chances are that you're missing out on a good number of opportunities. 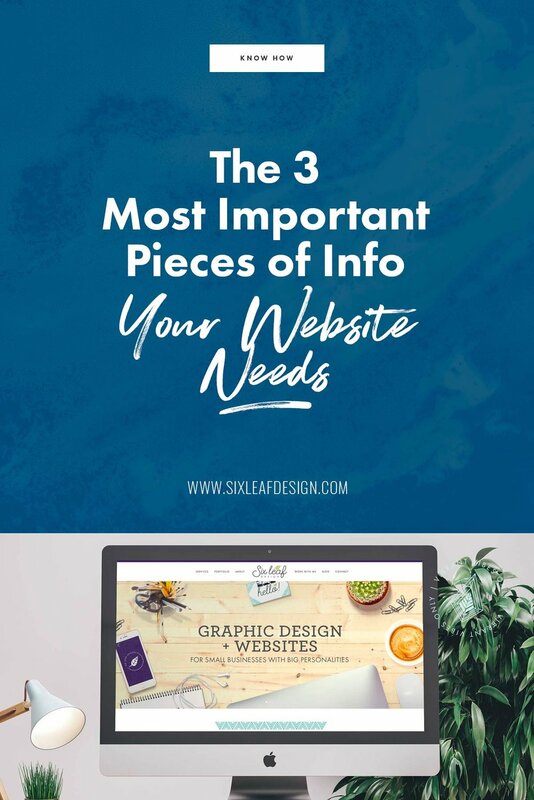 But if you don't have the time or resources to devote to building a big, strategic website with lots of bells and whistles, at the very least you'll want to make sure you have these 3 important pieces of information on your site and they are front and center where people can find them. Have you ever found yourself on a new website and you cannot for the life of you figure out what the heck it’s for?? There’s nothing more frustrating and you better believe that your potential customers will be frustrated too if it’s not clear what’s being sold or promoted right away on your site. That's why this is the first piece of info that I recommend including on your website’s homepage. If you don’t have a mission statement or catchy headline, don’t worry. At the very least you can state what you do and who you do it for. The very first banner on my homepage says front and center “Graphic Design + Websites for Small Businesses with Big Personalities” - right away you know what I do and who I do it for. After you’ve established who you are and what you do, the next thing people usually wonder is “what makes this person/business qualified to do this?” That’s why an about page is important. This is where you can tell your story and let your viewers know why YOU are the right person for the job. Maybe you have all the right certifications, or maybe you’ve had X number of years of experience so you know exactly what you’re doing. All those things will build trust with your audience to let them know that you are an expert in your field. Now that you’ve got them on the hook, you will need a way for people to get in touch with you. Whether it's your email address, a contact form, phone number, twitter - it doesn’t matter how you want people to contact you, but by having at least one way to communicate with you audience it again builds even more trust and let’s potential customers know that you are a real person they can reach out to. I know that I wouldn't use a product or service if I couldn't figure out how to contact someone to ask a question if I needed to. There’s nothing that will turn a potential customer off quicker than not being able to get the info they need to make a decision on whether or not to hire you/buy your product. So make sure that at the minimum you’ve got these 3 items of information included on your website to be sure you’re website is doing its job. Do you have these 3 things on your website already? What other info have you found to be important to include? Want to get more posts like this? Enter your info to be notified about new blog posts just like this. PLUS you'll get my 7 super secret design resources sent directly to your inbox to help boost your brand to the next level! *I respect your privacy and promise to keep your email safe.